Let’s head to Puerto Rico for a delicious mofongo! 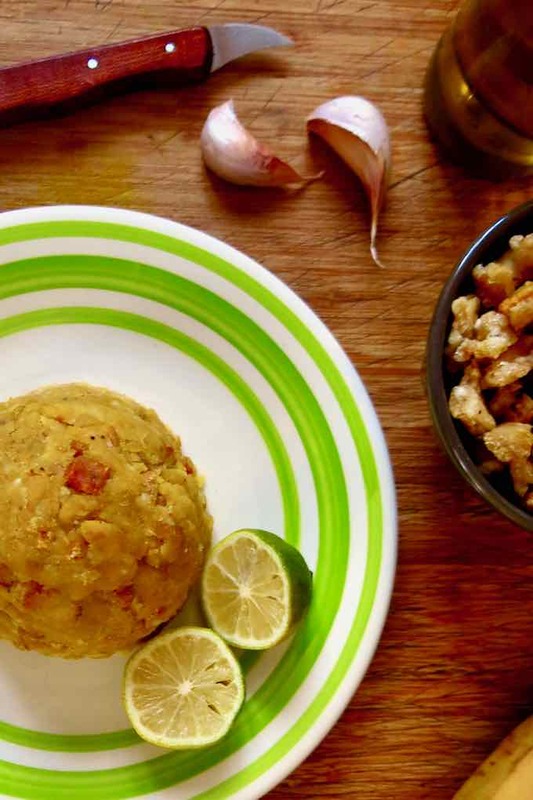 Mofongo is a mash of green plantains, that are fried and crushed in a mortar with garlic, oil and crunchy pork rind (chicharrones de cerdo). 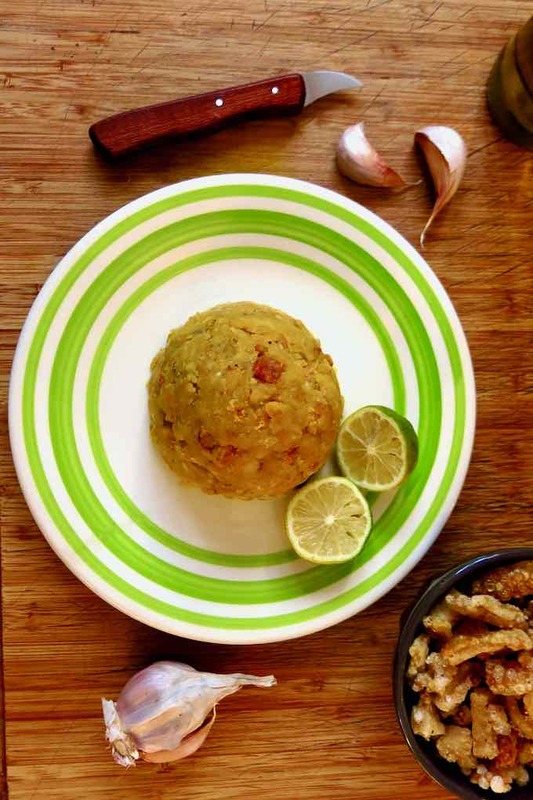 Mofongo is very popular on this archipelago, and it is the soul of Puerto Rican cuisine. It is found everywhere, even in the music as in the song Puertorriqueño by Joe Valle and César Concepción. This Creole dish appeared for the first time in an 1849 cookbook titled El Cocinero Puertorriqueño. Since then, many recipes have been developed around mofongo. 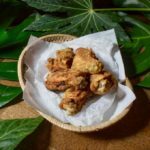 In its traditional version, it is made with chicharrones de cerdo (to simplify the recipe and if you can not find it, you can use cooked bacon so as to make it crispy) and is served with a creamy chicken broth and fried meat. 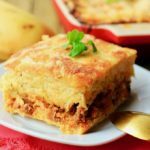 It can be eaten as an side dish or, since it is quite hearty, as a main dish. Some variations include beef stew or vegetables, shrimp, seafood, mixed with the mofongo or served on the side. Mofongo relleno is stuffed with these different ingredients instead of incorporating them into the mashed plantains. 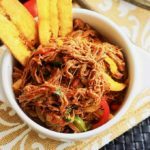 Sometimes, plantains are replaced by cassava (mofongo de yuca) or a combination of cassava and green and ripe plantains bananas, it is then called trifongo. 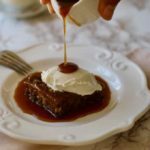 Since Puerto Rico has been part of the United States, a number of American traditions have made their way to the archipelago, including Thanksgiving. For the occasion, the Puerto Ricans stuff their turkey with mofongo, instead of traditional bread-based stuffing. 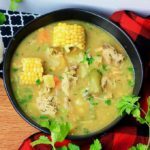 This Creole dish is quite similar to mangú which is very popular in the Dominican Republic. In Cuba, people prepare fufu de platano, also very similar to mofongo, for which the plantains are boiled and not fried. In Colombia, cayeye is a breakfast dish prepared with boiled and crushed green banana. What is the origin of mofongo? Puerto Rico is part of the Caribbean and especially the Greater Antilles. The archipelago is located between the Caribbean Sea and the Atlantic Ocean, close to Cuba and the Dominican Republic. Its history borrows from various cultures. First that of the Tainos, a Native American ethnicity, and then that of the Spanish settlers who arrived in the 15th century. The latter needed manpower to settle but the Tainos were not numerous enough. So they brought slaves from Africa who also brought with them the ancestor of mofongo, called fufu. Fufu is prepared with boiled and crushed flours made from starchy vegetables such as cassava, plantains or yams. The resulting dough is then eaten with a sauce. With indigenous and Spanish ingredients, fufu has evolved to give mofongo. Plantains are abundant in Puerto Rico. 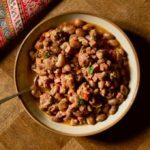 Also, the Spanish introduced garlic, olive oil and pork, which can be found in many Puerto Rican recipes such as arroz con gandules, rice with dried beans and pork, and habichuelas guisadas, a pinto bean stew with pork. 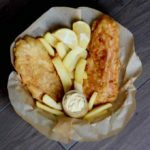 The frying method comes from Africa and the Puerto Ricans have widely adopted it. Kioskos along the beaches sell cuchifritos, which include all kinds of fried dishes or ingredients, alcapurrias (stuffed donuts with meat) or pieces of fried pork like chicharrones. 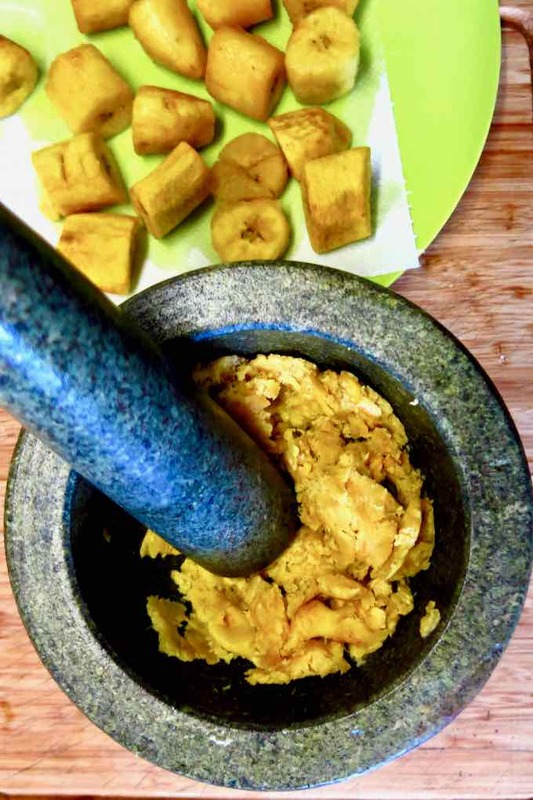 Mofongo is made by crushing the slices of fried plantains with a mortar and pestle. This technique comes from the Tainos who used hardwood mortars and pestles such as mahogany or guaiac, before the arrival of settlers, as evidenced by recent archaeological discoveries. If you do not have a mortar and pestle, you can use a potato masher or chopper to crush the plantain. 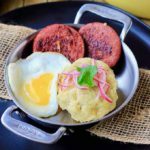 What is the origin of the word mofongo? 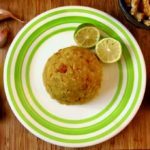 The word mofongo could come from the expression in the Kikongo language (a language spoken especially in Angola) mfwenge-mfwenge, which means a large amount of everything. It could also derive from the word mfwongo in a variant of the Kikongo language, that would mean “crushing”, and this is exactly what happens to the plantain. Mofongo is a typical Puerto Rican and Dominican dish that consists of fried green plantain purée, garlic, oil and pork rind. Boil the rind in water seasoned with salt and pepper for about 1h30 on low heat or until it is very soft. Drain and cut into small pieces of 1 x ½ inch. Dry the pieces of pork rind either in the open air for about 8 hours when the weather permits, or in the oven at 140 F for 5 hours. After drying, remove excess fat with paper towel. Fry the pieces of rind for 3 to 4 minutes on each side. 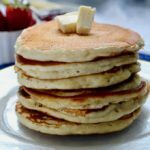 Remove them from the oil and place on a dish lined with paper towel. Lower the heat and plunge the pieces of rind back into the oil. Cover and fry for 10 minutes over medium-low heat, stirring regularly. Increase the heat to medium-high and plunge the pieces of rind for 2 minutes, without stirring. The rind should be golden brown. Cut into slices of about 1½ inch and soak in salted water for 15 minutes. Drain. Place on a dish lined with paper towel and dry well. Fry the plantains in the vegetable oil over a low-medium heat, turning them halfway through cooking. 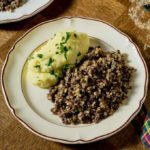 Be careful not to brown them because it may form a small crust that would make it difficult to reduce to a homogeneous mash. Remove the plantains from the pan and drain on paper towel. Using a mortar and pestle, mash the plantains while slowly pouring the olive oil. 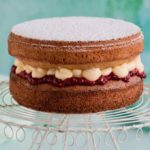 The desired consistency should not be too soft or too dense. The purée should be easily molded. Stir in the garlic and the pieces of rind and crush again with the pestle. 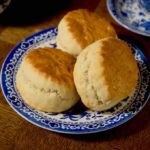 Divide the preparation into 4 parts. Mold the purée in the shape of a half-sphere by hand or using a small bowl, and serve.